The proposed role of Cxcr3-expressing T cells and DCs in neurofibroma development. (A) In Dhh-Cre Nf1fl/fl DRG/nerve, SCs express chemokines and growth factors that can recruit macrophages, mast cells, and T cells/DCs. This likely drives the initial immune cell infiltration at the site of neurofibroma formation, consistent with our finding that loss of Cxcr3 does not prevent macrophage or mast cell recruitment to 2-month Dhh-Cre Nf1fl/fl Cxcr3-null DRG/nerve. 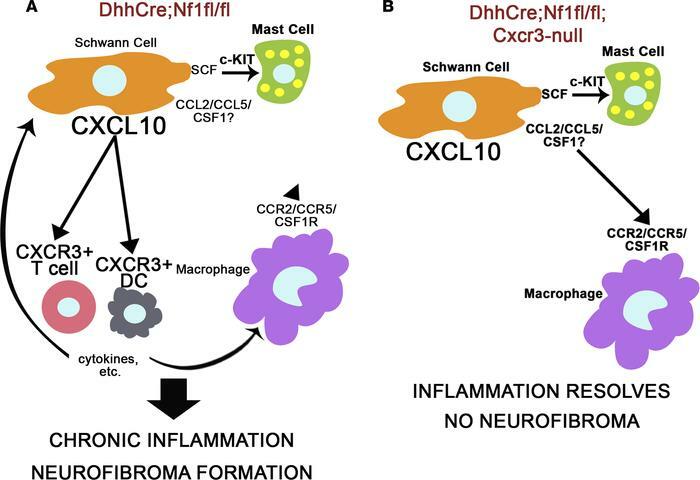 CXCR3 is predominantly expressed by T cells and DCs in Dhh-Cre Nf1fl/fl peripheral nerves and neurofibroma, and we hypothesize that cytokine production or other functions of T cells or DCs recruited through CXCR3 facilitate chronic inflammation and neurofibroma development. (B) Macrophage inflammation resolves by 7 months in Dhh-Cre Nf1fl/fl Cxcr3-null peripheral nerves, and neurofibromas do not form in these mice. We suggest that loss of Cxcr3 reduces T cell and DC recruitment to these nerves, allowing for the resolution of nerve inflammation and the prevention of neurofibroma development.